We have assembled a list of 7 reasons to schedule forklift training. If you are observing or experiencing any of the 7 items listed below then it may be the time for you to contact a forklift training company and schedule a forklift training course today. 1. Excessive Speed – Have you observed your operators driving too fast for conditions. OSHA does not limit or set a recommended speed at which a driver can operate. Rather OSHA 29 CFR 1910.178(n)(8), states that the truck shall be operated at a speed that will permit it to be brought to a stop in a safe manner. A few of the variables operator’s need to consider when determining the ideal speed include: the type of product, weight of product, ground conditions, proximity to others in the area, and the operator’s experience. In a coordinated training program these topics are covered in both classroom discussion and observed during the hands-on evaluation portions of the forklift training class. 2. Increasing Repair Costs – If you are noticing a major increase in your Powered Industrial Truck (PIT) repair cost then forklift operator safety training might help decrease your repair bills. One section of the forklift operator training covers the importance of pre-operation inspection. OSHA requires that the forklift be inspected at the beginning of each shift or after each shift when used around the clock. (This requirement can be found in OSHA CFR standard 1910.178(q)(7)). If followed then the need for a major repair can be reduced if it is identified early. 3. Unconventional material handling techniques – Improper loading techniques can cause damage to your product(s) and/or personal injury. Forklift operators that are transporting a load need to make sure that it is stable and secure. The failure to follow accepted proven material handling practices, very often results in accidents, injuries and/or death. Forklifts can tip over or the load can be dropped injuring the driver and/or others in the vicinity. According to OSHA 42 percent of the forklift fatalities were the result of the operator being crushed by a tipping PIT. 4. Witnessing or reported horseplay – Using the forklift in a manner that it was not intended could easily be compared to a ticking time bomb. If it is not stopped immediately and is allowed to go unchecked it is just a matter of time until something bad happens. An unloaded 5,000 lb. 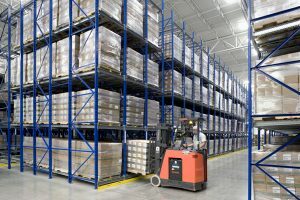 capacity forklift weighs almost 10,000 lbs.. Overloading, turning while the load is raised, driving with an elevated load, driving too fast for conditions are indicators of an improperly trained operator. Now add horseplay to the mix and you have a recipe for disaster. This is yet another reason to either contact a forklift training company and schedule forklift training. Another option is to use your own team of experienced forklift operator trainers. There are many complete training kits on the market designed for in-house training. 6. Are you planning to change your warehouse layout or flow of traffic – It is always a good idea to hold a refresher forklift class when there is a change in material flow. Many times questions will be asked, during the refresher training, regarding the new procedures/policy and it’s always best to address them immediately and systematically. Having a clear and enforceable written policy is best to have in place immediately following the training. Periodic observation i.e. walking the floor after the training has occurred, is recommended as a means to reinforce the new rules and ensure operator compliance to the new traffic flow rules. Some studies say it takes 3 weeks (21 days) for a person to break a habit, then there are those that say 66 days and there are even still other studies that it may take up to 254 days to break a habit or a routine. 7. No forklift training in place? – Do not wait until you receive a citation or worse a forklift related fatality to schedule forklift training for your forklift operators. Forklift operator training is required by OSHA. OSHA’s new civil penalties went up by 78%. These adjustments that took effect on August 1, 2016 are as follows: for each serious violation $12,471 and $124,709 for each repeated or willful violation. New forklift operators do not start out with the knowledge, expertise, and skills to safely operate a Powered Industrial Truck (PIT). It is because of this that OSHA requires all drivers must be properly trained. This can’t be stressed enough, operating a forklift without training is dangerous and can even be fatal to you or other employees working in the area. Don’t wait – schedule your training today! Great information on forklift training.Look forward to seeing more blogs from you.